Now that summer is finally here, my family is spending a lot of time outside. 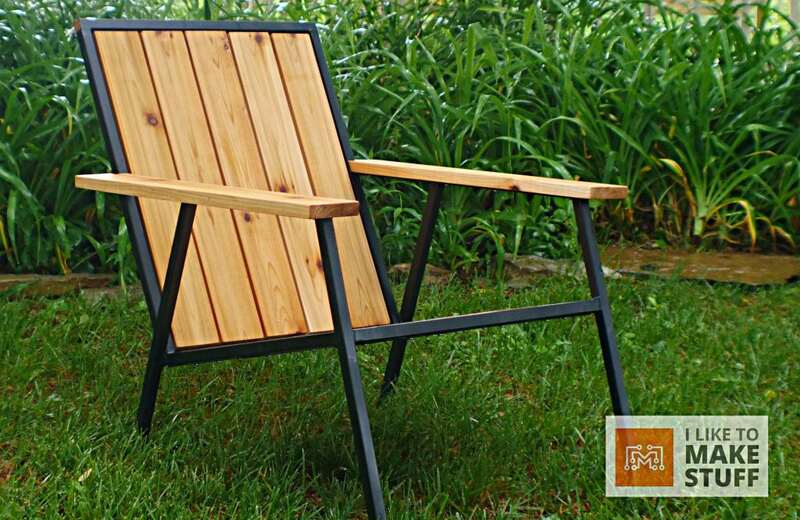 And I can’t transform into full-on dad mode without a proper outdoor lounge chair, so let’s make one. I didn’t use any traditional plans or furniture geometry when making this lounge chair. I just eye-balled the angles until the chair looked appropriately comfortable. Here’s how I made it. 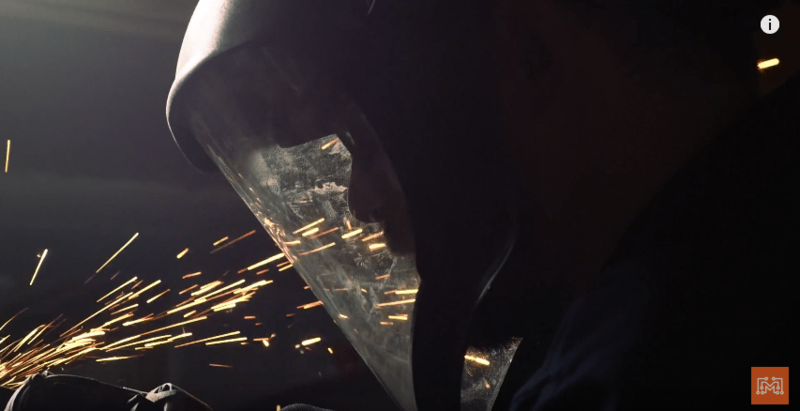 In the video, you can see me cutting steel tubing on a miter saw. This particular saw, the Evolution Miter Saw, is designed to cut both wood and steel, so please do not try to cut steel on a normal miter saw. Before I start welding the frame together, I used my belt sander to add a slight bevel to the ends of each tube. 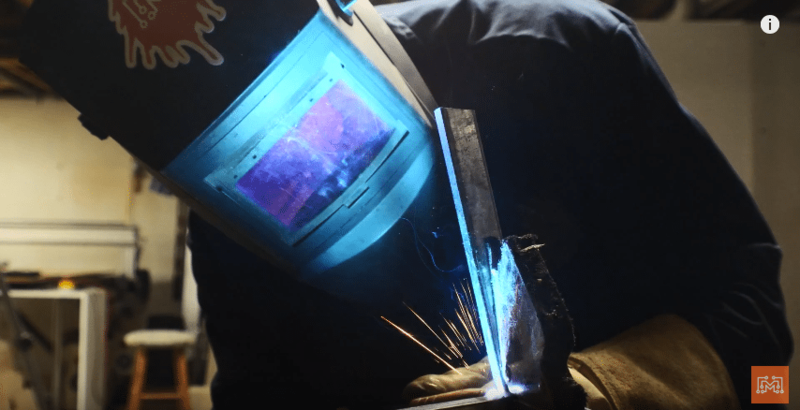 By doing this, you are making a channel that the weld can fill in, creating a stronger bond. I tacked all of the corners of the seat frame together to get a rough idea of how the chair will look. Once I bent and tweaked the frame to my liking, I went over each seam with a full weld line. Be sure to continually check that the steel tubing is parallel and the frame hasn’t warped from being moved around. Once I had all of the full welds in place, I used my angle grinder to blend the joints together. Not only does this eliminate any noticeable seam, it highlights where your horrible welds didn’t completely cover the channels. So, I went back and welded the missing sections and had to re-grind them as well. After this second round of grinding, I had a completed chair frame! I cut down some 1″x4″ cedar boards to match the lengths of the seat pan and the back frame. We totally lucked out because five of those boards fit perfectly spaced inside the chair frame. The arm rests were cut from the same material and a notch was added so they would fit along the back supports. 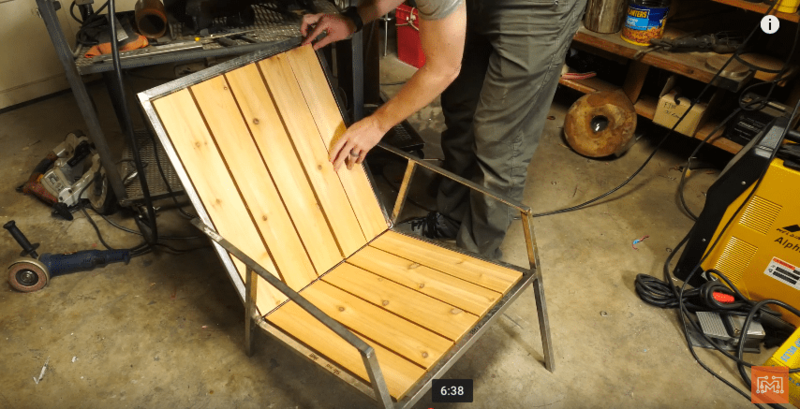 Because I wanted the wood to sit flush with the metal, I had to add a strip of flat steel to the back and bottom of the chair to hold the cedar slats. The strips were welded on and predrilled so that I could screw the boards directly to the updated metal frame. Now that the metal and wooden components were all ready, it as time for paint. 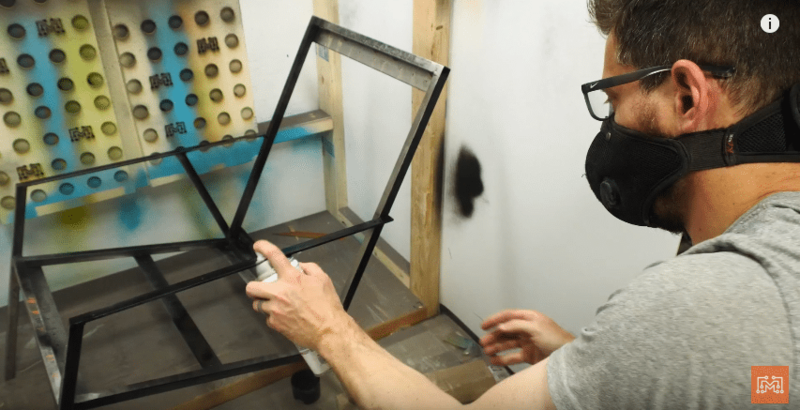 Even though this lounge chair would live outside, I chose to paint the frame a flat black using enamel paint. Your skin would only really touch the frame at very limited areas, so I didn’t have a problem with it. The black metal next to the bright and vibrant cedar looked amazing! Now, it’s time to put it all together. Using some stainless steel screws that shouldn’t rust, I attached the cedar planks to the seat pan and the back rest. To further protect the durable cedar, I added some tong oil which really brought out the cedar’s golden color. This chair absolutely beautiful and surprisingly comfortable. Again, I didn’t use any standard furniture geometry, so I was very happy that this chair actually pretty loungy. I put the chair in the back yard where my family hangs out and just relaxed for a bit. I’m really proud of this chair that I threw together, if you liked it, check out more of my work. 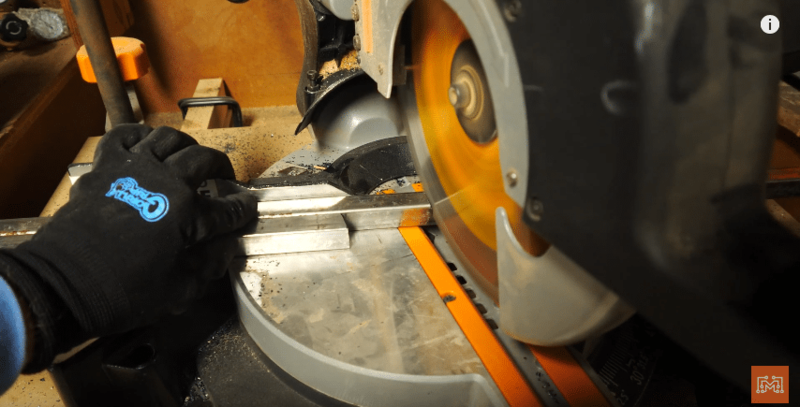 10″ Evolution Miter Saw for cutting Steel, Aluminum, Wood, etc.